In the last meeting of 2016 between the Toronto Blue Jays and Texas Rangers, a massive controversial event took place in Arlington. Things started to get heated Sunday night when the Rangers Matt Bush hit Jose Bautista to start of the eighth inning. 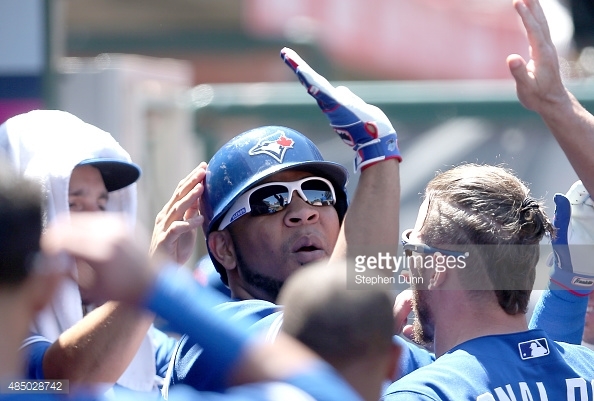 During Bautista’s last plate appearance, the Rangers decided it was time to get back at the creator of the bat flip. Originally Bautista would walk to first and not react. Once on base however, that’s where things began to escalate. When Justin Smoak grounded out to Adrian Béltre, who would flip the ball to Rougned Odor, Bautista would slide into second base hard almost taking out Odor. With a quick step, Odor managed to dodge what could have been a devastating slide, but he wouldn’t step down and move on. What took place next is what people will be talking about at the water coolers at work tomorrow morning. 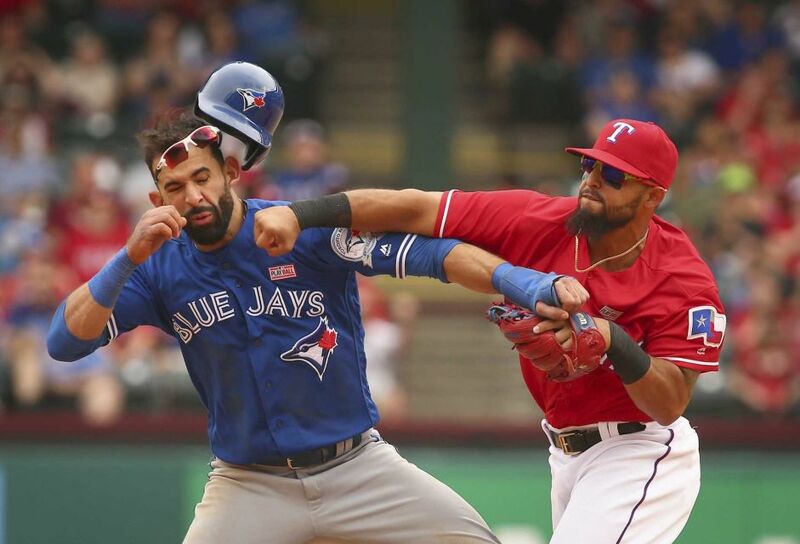 Odor would shove Bautista and throw a massive punch right square into Bautista’s jaw that started an all out bench clearing brawl. When Josh Donaldson came out to support his teammate, he almost received the same fate as Bautista as Odor tried to punch him in defense. Once the smoke cleared, we could see John Gibbons, who had already been ejected from the game, come back onto the field to help provide some guidance to his team and separate them so they could go back to the game. On his way out, he would have some words for the Rangers bench boss Jeff Banister. Both managers would see themselves to the clubhouse for the rest of the game which a suspension looming on Gibbons for coming back out to the field. Once things settled, and both clubs and their fans just wanted the game to end before more wood was put into the fire, Jesse Chavez would hit Prince Fielder on the first throw. Chavez would automatically get ejected from the game and the benches would clear once more. This time there were no punches thrown, and players went back to their respective dugouts quite quickly. Now comes the question for the night. Will both Bautista and Odor get suspended for their actions? Bautista with the illegal slide and Odor for the punch to the face. Some could argue that Bautista was trying to intentionally take out Odor and end his season. On the other side, Odor could have put Bautista on the DL with a broken jaw as he became very aggressive and clocked Jose in the face. How will one determine who should get suspended and if so, how long? Yes, Bautista’s revenge wasn’t within the new guidelines the MLB put out this year in regards to sliding to prevent injury, but this is baseball. If Bautista and the Jays wanted to get revenge, they should have done it on the scoreboard, winning the game. Instead, they fell 7-6 after all was said and done. The Jays had a big sixth inning thanks to Jose, but would still fall short. It will be interesting to see who the manager will be for Monday night’s game as I’ve said, Gibbons will be suspended for his re-appearance on the field in Arlington. First base coach Tim Leiper may also face suspension as he popped up into the dugout to witness the brawl, but was smart enough to not run onto the field. The Blue Jays will now head back to Toronto for a series against the Tampa Bay Rays starting Monday. J.A. Happ will face off against Drew Smyly. It’s 2016 and baseball has returned for the defending AL East division champions. The Toronto Blue Jays started their season opening in St. Petersburg, as they would play guest to the Tampa Bay Rays. Toronto would take the first two games of the series, winning both contest’s 5-3. Stroman and R.A. Dickey would both be rewarded with the victory for their efforts. Things then became interesting during Tuesday night’s game three. During the first three games, the Jays would strike out 36 times, leaving 12 batters on base, and would have game three end in a controversial setting. 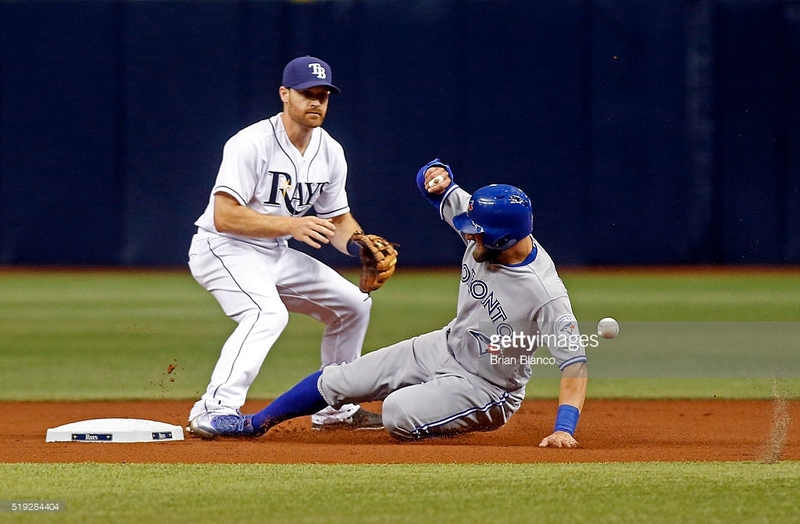 Heading into the ninth inning, Toronto would trail the Rays, 3-2. Having one out, and Bautista on first, Edwin would hit a grounder to Longoria who would initially throw a 5-4-3 play, but Logan Forsythe would throw the ball away, which would land Toronto two runs to take a 4-3 lead. Tampa would challenge the call on the field, and after further review, it showed the Bautista broke the new sliding rule when he put out his arm and touched the foot of Forsythe, which is in violation of said rule. The umpires would then call both Bautista and Encarnacion out on a double play, ending the game, resulting in a Tampa Bay Rays victory, giving them their first of the season. Heading into the fourth and final game of the opening series, the Jays would look to rebound, as they would send former Jay, comeback J.A. Happ to the mound to face off against Matt Moore. Reigning MVP winner Josh Donaldson would get the bats going early, as he would homer a three run shot to give the Jays a lead. Tampa would respond to two runs of their own scoring in the fourth and sixth inning. Nearing the end of the game and looking for a rebound win, Gibbons would send Arnold Leon to the mound to pitch in the bottom of the eighth, with the idea of sending either Storen or Osuna to the mound in the ninth to finish it up. Things didn’t go as planned however, as Leon would give up a home run to Souza Jr., which would score three, giving the Rays a 5-3 lead which would be the difference. The Canadian boys will now fly home and have an off day Thursday before opening up their first home series this weekend as they play host to David Price and the Boston Red Sox. Stroman will be sent to the mound Friday, followed by Dickey, as they will each be looking for their second wins of the season. Marco Estrada will be sent to the mound for the first time on Sunday, as he will face off against former Blue Jay rental, David Price. The Jays would see themselves with their backs against the wall once again. The Toronto ball club would be looking to get into the Kansas City Royals team who have been so dominate this post-season and force a game six back at Kauffman Stadium. Marco Estrada would be sent to the hill in hopes of keeping the season alive; as it would be a rematch of game one, Edinson Volquez would be sent out for the Royals. In the second inning, Chris Colabello would help get the ball rolling, as he would launch a shot into left center field to strike first, making it a 1-0 game. Marco Estrada would do his part defensively sitting down the first nine batters he faced. He would start the nine batters by sitting down Alcides Escobar who would not reach base in the first inning for the first time in five games. In the sixth, after Revere and Donaldson would reach base safely, Bautista would battle Volquez through ten pitches, but would ultimately walk loading them for Edwin Encarnacion. Volquez would continue the trend by walking Encarnacion making it a 2-0 game. Volquez would get pulled as Kelvin Herrera came in as relief. Troy Tulowitzki would make Herrera pay. Tulowitzki would crank a double to center field scoring all three runners on base, now a 5-0 contest. Tulo would set franchise history with the double as he now leads the Jays in RBI’s during the ALCS with 7. Candy Maldonado (6, 1992) and Paul Molitor (5, 1993) follow behind. In the last six games when the Jays have scored five or more runs, they have won all six of those match-ups. Heading into the eighth, Estrada would still be on the mound, which would help with Toronto’s already depleted bullpen. He would only give up 1 hit through the first six innings. However, Estrada would give up a home run to Salvador Perez in the top of the eighth, and then followed by a single. That would wind up being the end of Estrada’s night. When Gibbons came to take the ball, you could read his lips saying wow. He was truly amazed with his performance in this crucial match-up. 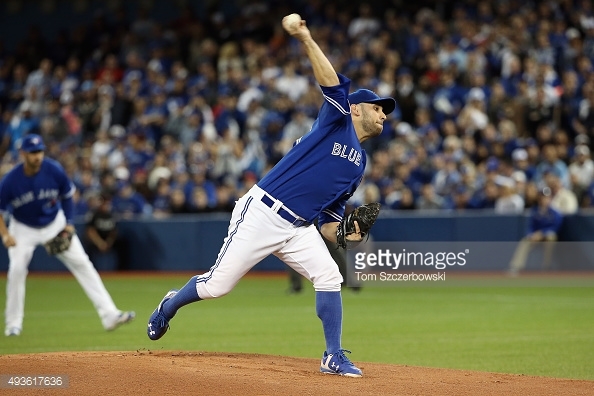 “He’s a master at what he does” Gibbons said about Estrada. “The fans game me all the energy I needed. We’re not done” said Estrada on the fan support from the over 49,000 blue jays faithful. Estrada would end up going 7.2IP, giving up only three hits, while striking out five. 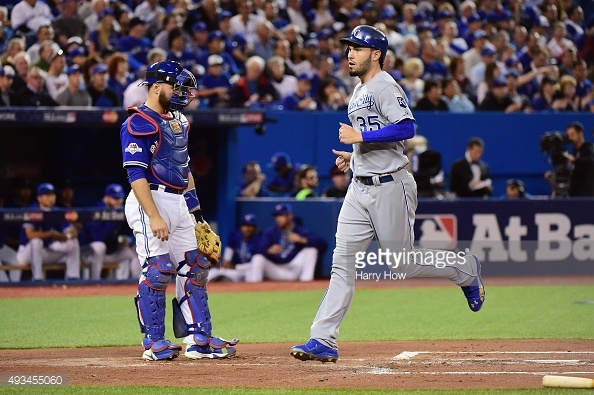 In the end, the Jays would go on to win 7-1 over the Royals, forcing a game six Friday night in Kansas City. Tonight would be the fourth elimination game the Jays have won and they hope to continue that trend. David Price will take the hill in what we will see as a game two rematch as Yordano Ventura will be sent to the rubber for the Royals. Over the weekend, it was quite a site to see for Blue Jay fans as their team faced off against the Angels of Anaheim. Looking to gain more ground in the Wild Card spot as well as potentially take back first in the east, the Jays had a lot of work to do. Well, the bats went to work over the three day set. The Jays would set a franchise record for the most runs scored (36) and hits (48) within a three-game series. The three key players for this record to take place included Josh Donaldson, Jose Bautista, and Edwin Encarnacion. The power trio would go to the plate for 21 hits, 3 homers, and 19 RBI’s in the series set. 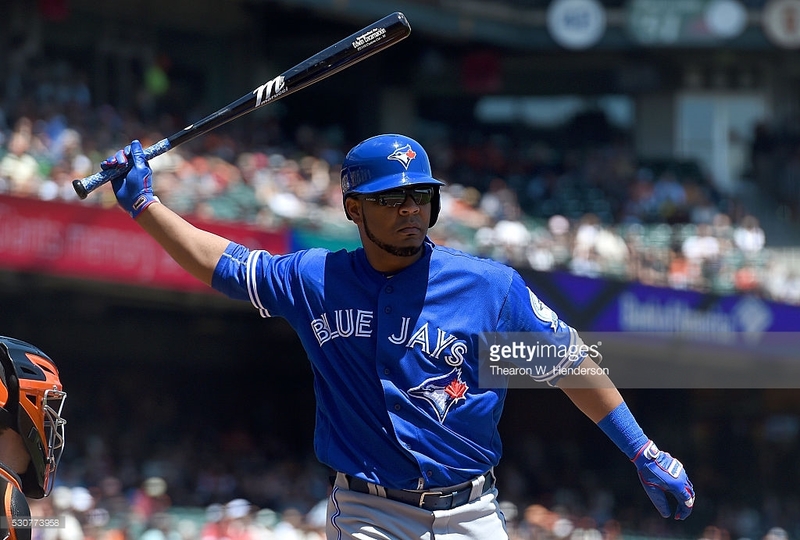 Another person to watch tonight will be Edwin Encarnacion. He is currently riding a 19 game hit streak and will look to continue that as he climbs the rank of players with the longest streaks in the franchise. The leader of the list, Shawn Green. Green has a 28 game hit streak in 1998. The Jays will now head into Arlington to face off against the Rangers (64-59) who just took 3 out of 4 against the Tigers over the weekend. They currently sit 3.5 games back from the first in the AL West, but are sitting in the second wild card spot heading into tonight. They Jays and Yankees are tied at 4.5 games for first, but that will change quickly over the next few days. The Yanks are set to take on the Houston Astros who currently lead the AL West. The starting matchups for the Jays this week will be Buehrle/Holland, Price/Lewis, and Estrada/Gallardo. Buehrle will be looking for his 14th win of the season tonight as the club looks to back him up and get the bats going early as they look for their fourth straight win. First pitch will be at 8:05PM EST. All in all, there is one thing for sure. Over the next week, there will be a lot of scoreboard watching by all the teams around the league as August wraps up, and we head into the final season of the regular season. Teams are putting their final ounces of gas into their tanks to boost themselves into key spots needed respectively in order to see some October baseball.